Chris Holt aka The Toy Viking is right about this one! Kidrobot is one of the best places to work. Recently three of our in house designers have been given their moment in the limelight with the upcoming Dunny mini series, The Wild Ones.. see what The Toy Viking had to say! In case you were wondering, Kidrobot is a pretty amazing place to work. Most people would be excited just getting to play with toys for a living, but we go above and beyond to make sure each and every employee is kept at a maximum happiness level. To achieve this, we have outfitted our offices with amenities that would make any other company look like prison by comparison. There’s the swimming pool out back, along with the roaming petting zoo that goes from desk to desk with a selection of forest critters just waiting to be snuggled. Do you know production goes up three fold when you have a family of possums nesting in your shirt? The break room is really something to behold, with a reality tv show chef there to suggest adequate microwaving time for your frozen meals. It’s also equipped with a full size replica of Rome’s Trevi Fountain that is filled with pulled pork instead of water. Majestic doesn’t even begin to describe it. All of these things not only make for smiling faces, they also make for killer art as witnesses by our in house artist’s contributions to The Wild Ones. Josh Divine, Johnny Draco, and Sharon Park all lent their unique points of view to one figure each, allowing them to step out from their more anonymous duties helping to produce everyone else’s toys. I managed to get all three in my case, which felt like collecting a mini set within the set. I guess the entire series really feels that way come to think of it. I just had a little epiphany as I typed this and maybe you had one too as you read this, which means we are now bonded for life. I’ll be looking for my dinner invitation. 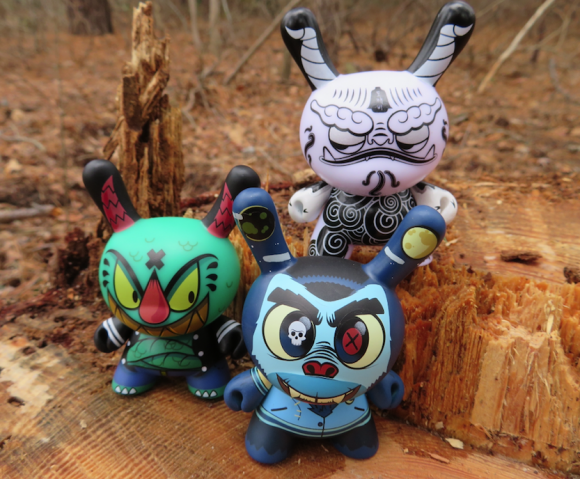 Collect these figures and more when The Wild Ones Dunny series releases on Friday, February 9th, at www.kidrobot.com.